Below you will find a recipe for a delicious yet Quick Cream Cheese Yogurt Fruit Dip made with only 4 ingredients. Recently, I was asked to bring fruit to a family party. I had just gone shopping the night before and had blackberries (they were on sale $2.00 a pint! ), strawberries (also on sale) and bananas (super affordable). I was grateful that I was asked to bring something I already had on hand and that I had just found some really great deals on fruit and berries. After assembling the fruit on a platter, it looked a little boring. I wanted to liven up the platter with a dip. 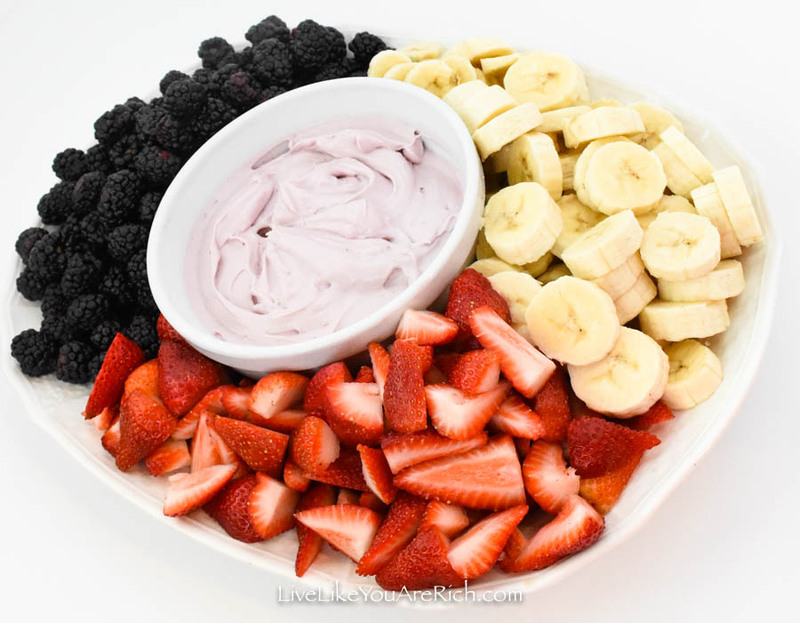 The problem was, I hadn’t gotten the correct ingredients for a typical fruit dip. 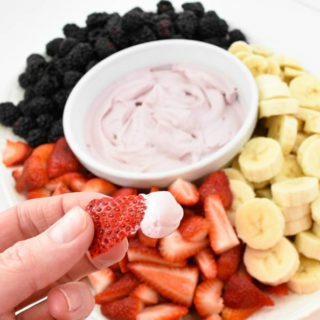 I had never made a fruit dip out of flavored cream cheese before—and that is all I had. Despite this unchartered territory of using flavored cream cheese for a dip, I decided to give it a whirl. The result was a fruit dip that my family all raved about and consumed entirely. Don’t you love when these ‘mishaps’ turn into successes? I do. The best part about this dish is that you can use a variety of flavors to tailor it to the fruit you will have on the platter. I used a Mixed berry whipped cream cheese and a strawberry and black currant greek yogurt which paired well with the fruit I had on the platter (this was actually a lucky coincidence—as I just used what I had). You could use a peach greek yogurt and plain cream cheese and serve with fresh peaches! I’m currently thinking of a tropical platter with a passion fruit dip (passion fruit is one of my favorite flavors). 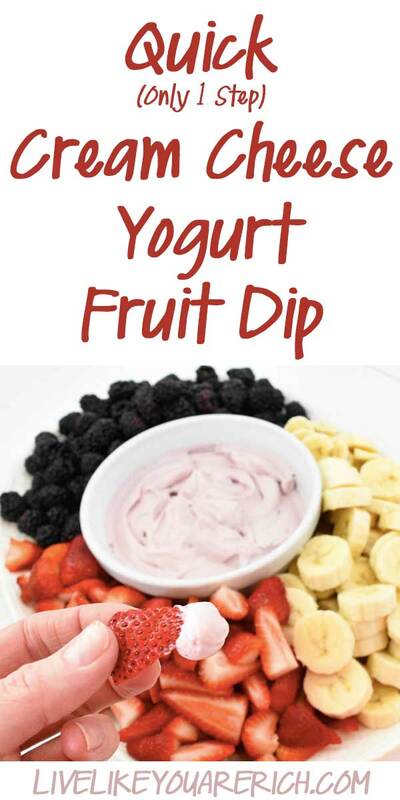 This is a very versatile recipe that can be used for any fruity combination you desire. Beat all the ingredients together in a stand mixer or with a hand mixer for several minutes until smooth and cream. Taste test (always taste test), and then add more honey or vanilla extract as needed and beat until smooth. Refrigerate until ready to serve with fruit. 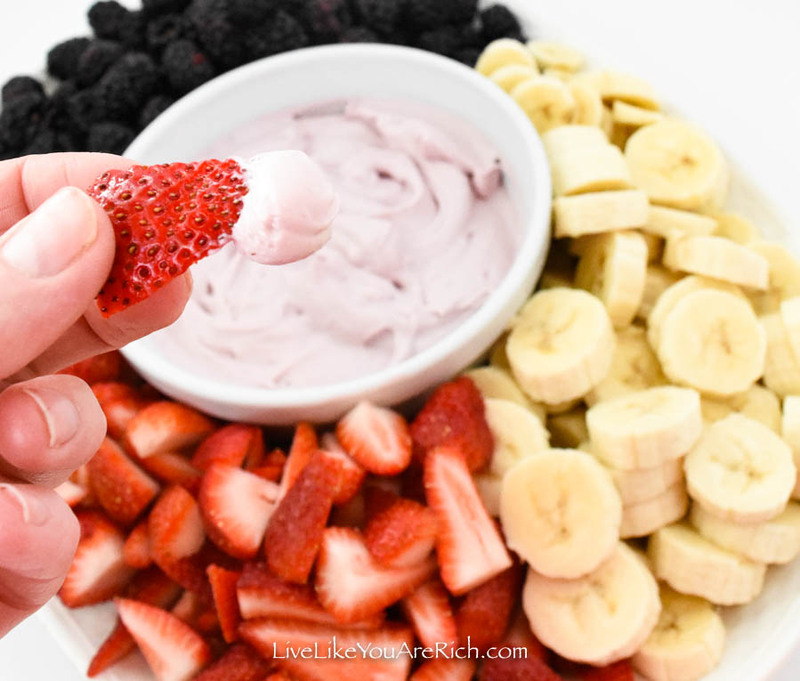 Like I titled it, this is a very quick cream cheese yogurt fruit dip! 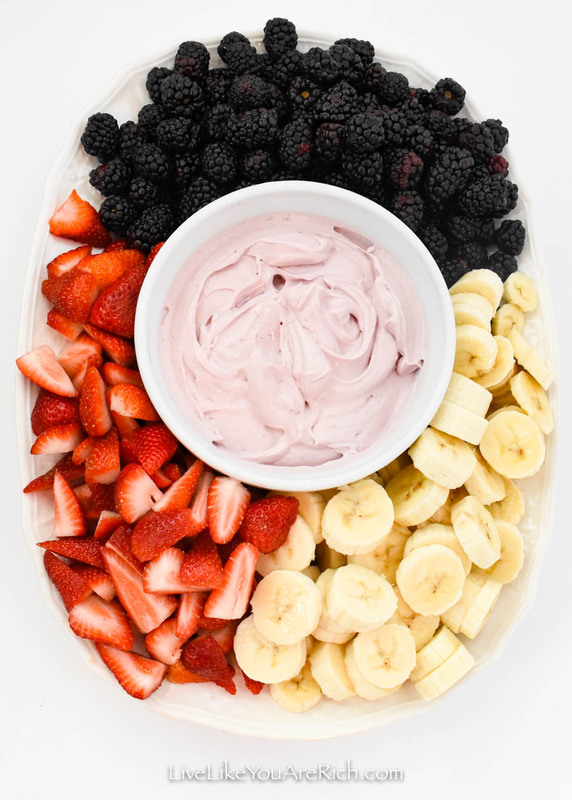 This is also a very fitting 4th of July dish as you have red, white, and can use blueberries or black berries for blueish tones!